Currently, finding alternatives to high tier, non-preferred, non-formulary and uncovered drugs is a cumbersome, trial-and-error process that costs health plans, prescribers, pharmacists and patients time and money. Even among generics there can be large price variations. Formulary creators who must manually choose the best alternatives face a daunting task that requires ongoing maintenance and review. By automating the delivery of preferred alternatives through existing EHR capabilities, payers can increase the use of preferred drugs, decrease prescription costs, and save prescribers time. BenMedica’s SmartAlts™ provides a cost-effective solution for establishing and updating formulary alternatives. In an earlier post we discussed using F&B data to communicate drug alternatives to prescribers in their EHR at the time of prescribing. RTPB transactions are another option prescribers can use when identifying alternatives. RTPBs are a growing part of the market as more EHRs integrate this capability. We expect adoption of RTPBs to accelerate significantly once NCPDP (an ANSI-accredited Standards Development Organization (SDO), that uses a consensus-building process to create national standards for real-time, electronic exchange of healthcare information.) completes the development of its standard. This standard is likely to be adopted at a federal level. While RTPBs are an important capability within the EHR, they are not the optimal way for prescribers to determine alternatives. RTPBs require the prescriber to write the preponderance of a prescription’s details before returning patient out-of-pocket information such as copays and deductibles as well as potential drug alternatives. 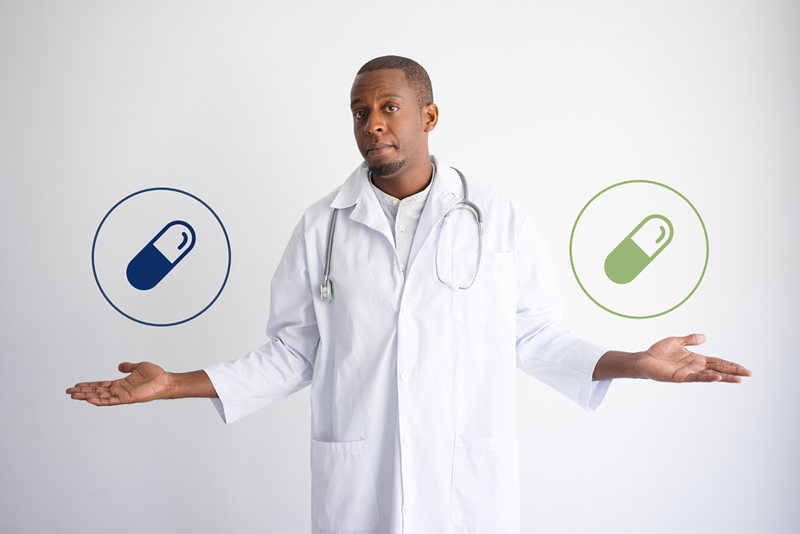 Using RTPB, the prescriber may not know if there are a less expensive but suitable alternatives until the initial prescription is almost completely written. We have found that many health plans do not leverage the capabilities of F&B data and RTPBs to provide alternatives. This leaves prescribers without critical information on alternatives and patients stuck paying more for prescriptions or abandoning them altogether. SmartAlts are curated lists of therapeutic drug alternatives that can be used in a variety of applications including patient or provider-facing web tools, prescribing systems, and mail campaigns. BenMedica has developed a proprietary process to create and update formulary alternative drug listings using clinical evidence found in published primary research, reference textbooks, structured reviews, and expert opinion. This provides a more succinct list of clinically-informed alternatives than those found in compendia or standard drug database therapeutic classes. When paired with formulary status and pricing information, this smaller, more targeted drug alternative list provides end-users with alternatives to their currently selected drugs that are less costly but perform similarly. Selecting lower-cost alternatives reduces pharmacy costs, saves patients money, and increases the use of preferred medications. BenMedica has successfully assisted health plans in developing alternatives for use by prescribers in EHRs. Automating the creation of SmartAlts alternatives based on current formulary and benefit data offers reliable communications with relevant information to prescribers. With formulary and benefit data, health plans can use an existing feed to communicate to prescribers. With deep experience developing processes to best leverage existing data, BenMedica helps health plans reach prescribers at the time of ePrescribing. Contact us to learn more.